Hex is a translation from the Dutch of a novel by Thomas Olde Heuvelt. However (as the author's end note points out) it is slightly more than that. The author, who is fluent in English, not only decided to shift the story's setting from a village in the Netherlands to a rural town in America's Hudson Valley in upstate New York, but also apparently completely re-wrote the ending. I have no idea how the original Dutch version ends, but I would, if I'm being entirely honest, have liked the translation to retain the Netherlands setting at least. There are already a million horror novels set in the US and I would have liked a more Dutch perspective. That said, the setting of the translation is rendered very well, and the history of that area means it does retain some of the 'Dutchness' of the original - there's a touch of Washington Irving's Sleepy Hollow about it. Hex also has one of the cleverest and most original premises of any horror novel I've read in a long time. Back in the 1600s, the townspeople of Black Spring tortured and executed a woman they believed to be a witch, forcing her to murder one of her own children and then killing the other themselves. Such was the cruelty of their actions that Katherine van Wyler, the wronged woman, cursed the town for eternity and continues to haunt it, her eyes and mouth stitched closed and her arms pinned to her body with chains. If her eyes are allowed to open, or her voice heard, horrific things will befall the town and its people. Moreover, once people move to Black Spring and become aware of the witch's curse, they can never leave the town for more than a few days without suffering terrible consequences. This in itself is not, in fact, particularly original; there are many legends and folktales like it. What makes Hex different is the way the townspeople deal with their predicament. Black Spring is essentially a town in quarantine, governed by a small council and with its own legislation - the rather sinister 'Emergency Decree' - which forbids the townspeople from speaking of the witch to outsiders. When the witch appears - which she does every day, appearing silently and alarmingly solidly not just in the street but also, incredibly creepily, in people's homes, where she stands wherever and for as long as she chooses - the townsfolk register her location using Black Spring's own app. If the witch appears in public, steps are taken to conceal her from any outsiders who might be present. At the start of the book, this is actually as funny and absurd as it is creepy. The witch herself, blind and silent, is very sinister indeed, and the thought of suddenly finding her standing, alarmingly solid, in one's home for days at a time is frankly terrifying - but the matter-of-fact and slightly farcical manner in which the townspeople deal with this is undeniably funny. Dishcloths are draped over her face. Jokes are cracked. When she appears in public, volunteers hide her behind temporary street furniture or fake construction hoardings, or even just gather around her to conceal her in a crowd. The catalyst for the plot is a series of experiments by a group of teenage boys led by Tyler Grant, determined to find out just how far the witch's curse goes and convinced that there is a way they can 'go public' and be free of Black Spring forever. But their activities bring out the worst in one of their number, and eventually unleashes a terrible evil - but who, in fact, is its source? Is it the witch's curse that drives the townspeople to do terrible things, or does the real horror come from town full of people isolated from the rest of the country for centuries and unfettered by legal and social norms? For all their apps and commutes to out-of-town jobs and modern conveniences, how far have the people of Black Spring really advanced since the days of witch-burnings and public flogging? Hex is an unsettling and at times extremely sad novel, and despite its darkly comic opening chapters, it soon becomes almost wholly dark. The picture of humanity that it builds is a rather bleak one, and the most sympathetic characters might not necessarily turn out to the ones you expect. It also raises some uncomfortable questions about parenthood and family. The horror is mostly very deftly done - you'll almost certainly find yourself feeling nervous that Katherine van Wyler might be standing silently in your bedroom one day, reeking of the grave and whispering through dead, sewn-up lips - although it does escalate to a climax that I found a little overblown at times. My only other complaint is that the dialogue, particularly where Tyler and his friends are concerned, sometimes feels a little forced and grating in its wisecracking jocularity; Thomas Olde Heuvelt and his translator are, I think, better when they tone this down. 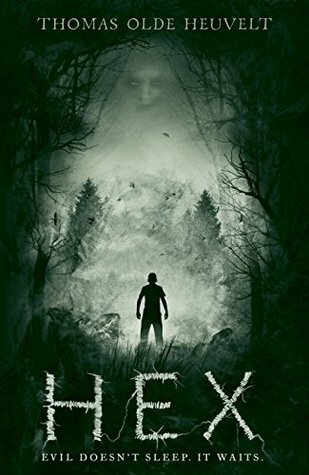 Overall, though, I found Hex a refreshingly different and fascinating horror novel and would definitely like to read more by the same author.